Over the past few years, Rob Damiano has been building up a believable world around his Classic Space-inspired Nova Team. We have featured his work before and were pleasantly surprised to see this lovely Nova Team star-fighter. 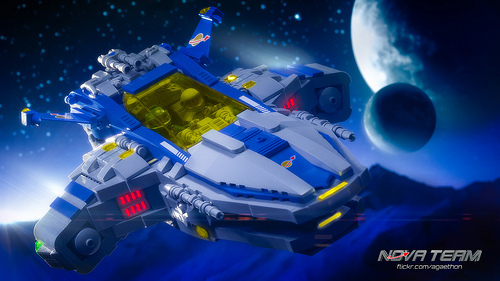 In a nod to the Classic Space ship numbering system, Rob named his star-fighter the LL-824 Paladin, and it is clad in the iconic blue, gray and trans yellow colors. It looks incredibly fun and swooshable. However, what really makes Rob’s work stand out is his photography, which utilizes a mix of practical effects and digital editing. While the Paladin is great, the setting and lighting help bring it life. It is reminiscent of the lively scenes found in LEGO product catalogs of the 1980s and 1990s, which also happen to be one of Rob’s sources of inspiration.